Louhelen offers visitors a relaxed, inviting setting for many types of functions. Friendly, professional staff assure that conferences and seminars run smoothly, meeting particular needs with courtesy and cheerfulness. For availability, please e-mail us, or call 810-653-5033. Louhelen offers a relaxed rural setting for a weekend retreat or conference. 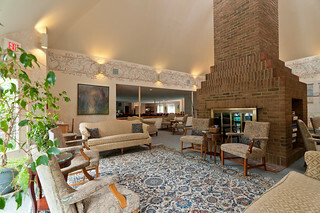 Open, comfortable common areas and warm, cozy private spaces offer varied settings for many types of gatherings. Use of a meeting room is complimentary with a minimum number of participants. 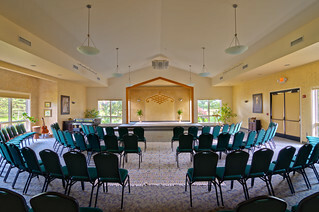 Our largest gathering space, Unity Hall, can seat up to 200 guests for lectures, discussions, or entertainment. Standard meeting rooms seat up to 20 with seminar tables, or 40 theater style. 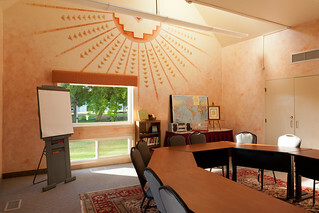 A larger meeting room seats up to 45 with seminar tables or 95 theater style. The décor is multicultural and inviting, with many windows allowing for plenty of natural light. Continental breakfast or an afternoon snack may be served in the room for an additional fee. 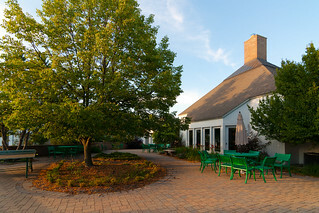 Louhelen’s Twin Oaks Dining room is perfect for award banquets, company dinners, open houses, and other celebrations. Lunches and dinners are served buffet style and always include a salad bar, beverages, and linen tablecloths and napkins. Light snack options are also available. Audiovisual equipment is complimentary. A speaker's table with microphone is available on request. Please note: Louhelen is an alcohol and tobacco-free environment. To receive a complete information package, including rate information and availability, simply e-mail us, or call us at (810) 653-5033.